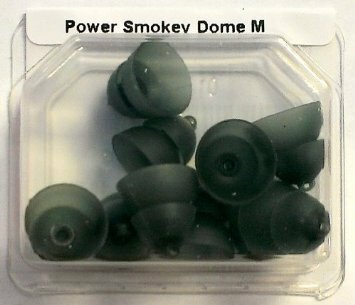 New 10-pack of Power Smokey Domes size Medium. These are Phonak's new version of Medium size Power domes. Will work just as well as the previous clear Medium Power domes. Due to hygiene reasons, this product is not refundable or exchangeable. Please verify size and type before ordering. At The Hearing Aid Battery Club, you know you are buying safe, factory sealed products, hearing aid accessories and batteries, and replacement parts. Thank you for you patronage! Phonak Hearing Aid Smokey Power Domes, Size Medium. Package of 10 Phonak Hearing Aid Domes. Phonak's new version of Medium Power domes. Original parts from Phonak direct from the Hearing Aid Battery Club. If you have any questions about this product by Phonak, contact us by completing and submitting the form below. If you are looking for a specif part number, please include it with your message.